This course aims to prepare students for employment in the Hairdressing Industry. 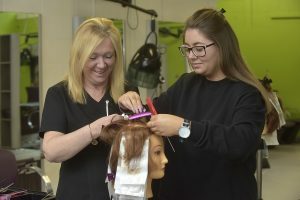 Students will be given training and confidence to secure an Apprenticeship in a Hairdressing Salon. Emphasis is put on all key areas of the industry which will enhance students’ techniques, creative and inter-personal skills. All practical training takes place in our fully equipped Hair Salon. Leaving Certificate (including LCA) and interview.